We would like to thank you for giving your confidence in us and our products during the past year. After more than 1.000.000 components used in the Pegasos II production, we would like to take this opportunity to thank our customers. The "How to build the machine" video is our Christmas gift to you. 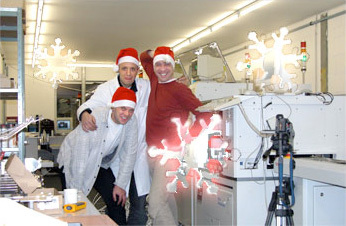 We wish all our web visitors a Merry Christmas and a Happy New Year 2005. The images and videos on this page are copyright by bplan GmbH. All rights reserved. No redistribution or modification is allowed without explicit permission.